A beautiful 15.1 hand chestnut and a Minnesota Fall Fest champion as a 2 year old and a Scottsdale top ten at the tender age of 3 years old. Apollo is a son of VP Eloquence, a grandson of the legendary El Hilal and a great grandson of the world famous Ansata Ibn Halima and Bint Nefisaa. Also gracing his pedigree is Sheila Varians foundation stallion, the incomparable Bay Abi and the Gainey related Bu-Zahr. 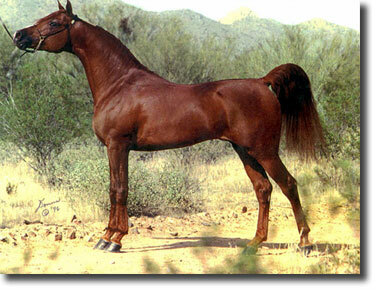 His dam EAS Bay Sara is the premier brood mare at North Woods Arabians owned by Kathy Monico. Most trainers and breeders alike agree that Apollo is one of the most typey and correct stallions standing stud today. Power, beauty and correctness with personality to burn.